A seafood boil is to fish and crustacean lovers what a tailgate party is to football fans: a communal eating experience that makes everyone forget about politics for one glorious afternoon. While seafood boils are traditionally accompanied by copious amounts of beer, the Tuttles have a new white wine for you to sip while debating whether it is cray or craw that preceded fish. For those who canceled their subscriptions to Bon Appetit in 2009, umami is a savory quality to go alongside sweet, salty, sour and bitter. Think of it as either the fifth flavor or the Billy Preston of the food world. With tomalley, Barnaby is speaking both figuratively and literally when he uses the word visceral. Tomalley is derived from tumale, a word used by the Kalina people in South America to describe a sauce made with lobster liver. People in other parts of the world also use the word to refer to the hepatopancreas of a crab, aka crab fat or crab guts. Crab tomalley’s yellowish color, intense “crabby” flavor and creamy texture can be off-putting to some but powerfully addictive for others. The list of possible white wines to pair with seafood is a long one. Thanks to the Tuttles, you no longer have to waste time deciding because they are all in the Crab Tomalley. As Olga rattled off the long list of grapes, here’s what I was able to write down before my fingers starting going numb: Pinot Noir, Riesling, Pinot Gris, Pinot Meunier, Pinot Blanc, Gewürztraminer, Sylvaner, Chasselas, Huxelrebe, Scheurebe and Müller-Thurgau. The grapes come from seven different vineyards in the Willamette Valley and at the edge of the Coast Range. The Crab Tomalley leaves no grape unpicked in its mission to provide you with the ultimate in seafood refreshment. The wine is made in traditional Teutonic fashion with grapes from old, high-elevation, dry-farmed vines. Fermentation is triggered by wild yeasts living on the grapes and in the air of the winery, after which the juice stays on the lees for seven months in neutral oak barrels before bottling. That simple process results in a complex wine a shade shy of a moonbeam in color. A few quick swirls of the glass results in an eruption of citrus and tropical fruit aromas, with a bit of minerality and an herbal note floating about in the background. I realize tasting notes are inherently subjective and my guava might be your carambola, but for me, the Crab Tomalley smells like kaffir lime, sweet basil, wet rocks and a pineapple granita. Need a corresponding image? Go look at Don Ho’s shirt in season two, episode one of Charlie’s Angels. In terms of the palate, it is surprisingly fuller-bodied and tiptoes up to the edge of dry territory at a “Teutonically” precise 11.84 percent alcohol. There is plenty of acidity as well. Flavors range from lemon sorbet and lemon verbena to a warm brioche and honey-lemon tea. 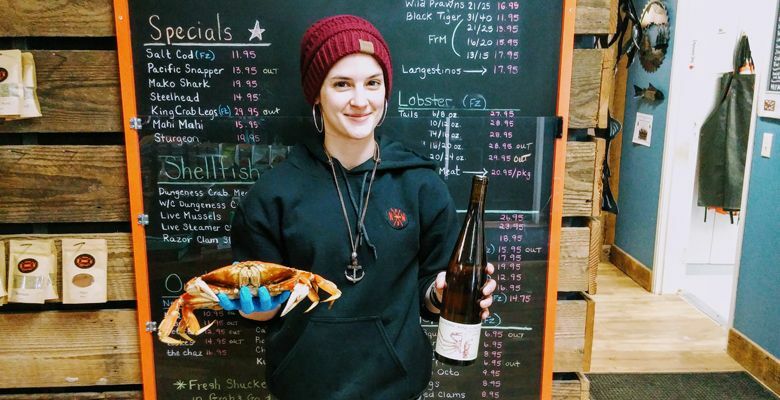 This wine will surely pair beautifully with any number of creatures pulled from the ocean, especially crab — and their tomalley. Barnaby likes to make a soup and a salad dressing with his crab guts, all the while drinking his Crab Tomalley wine from a cleaned-out crab shell. He has also invented a visceral cocktail known on the street as the “Clawtini.” Barnaby’s wine and cooking have inspired me to try out an old Scottish Highland recipe I recently discovered in a book. The recipe is for a pâté made with toasted sourdough bread crumbs, crab tomalley, vinegar, salt and black pepper. Bonus points if you use the crab shell as a serving bowl. The Crab Tomalley is the best thing to happen to crabs since Gustav “Bay Spice” Brunn arrived in Baltimore in the late 1940s with his trusty hand-held spice grinder. At a suggested retail price of $21, it is also a heck of a fine bargain. 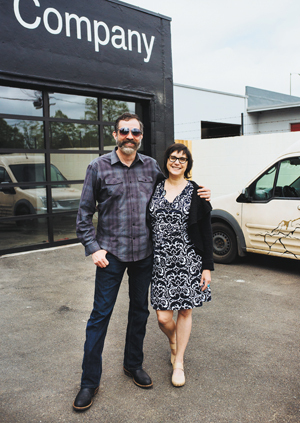 Barnaby and Olga made only 90 cases of the Crab Tomalley; most of those will be found at their winery and at a number of New Seasons Markets. So, hurry to find it because, as is the case with all great wines that are well-priced, they are here today, but gone tomalley. THE CHANGEUP is a baseball pitch designed to disorient and confuse. It’s the perfect representation of the unknown and its mastery over those who think they know what to expect. 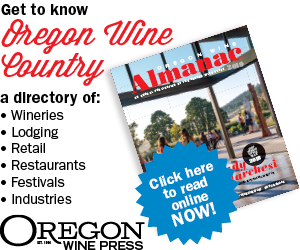 This column is devoted to those unorthodox Oregon wines you never saw coming.